Anyway, as was previously speculated would be the case, the popular ad-supported Kindle will now be playing host to a series of locale specific deals through the AmazonLocal program. The AmazonLocal program, for those who have yet to get any information about it, is a local deals web service that offers customers as much as 75% off of various goods and services in their areas. They launched it earlier this year, and have been spreading the service’s influence throughout the US. So far, 44 locations across 15 states are covered and more are popping up all the time. While it is separate from the Amazon owned LivingSocial deal site, many deals sourced through LivingSocial can be found in both places. 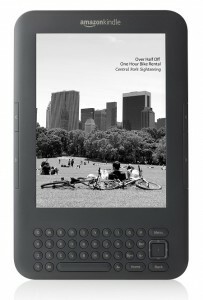 The major attraction of the Kindle integration with AmazonLocal will be the completely computer-free access to the service. Not only will potential customers be able to encounter new deals as a matter of course without going out of their way, just by closing their books and glancing at the screensaver, but even the purchases will be taken care of. 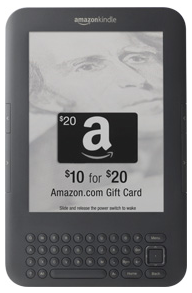 Customers wanting to make the purchase offered through this program will be able to grab it through the eReader and present the redemption voucher as an item displayed on the screen to the business in question. This functionality, while not yet a part of the Kindle experience, will be included in an upcoming software update. Once again, it seems that devices that do not have the integrated Special Offers will be left out of the promotion, increasing the overall appeal of an ad supported eReader. Given the unobtrusive nature of the advertisements while reading, and the value of the advertisements that have been and will soon be offered, it will be no surprise if the Kindle w/ Special Offers is appealing for far more than simply the associated price cut. Should you be somebody who is both interested in the offers and uninterested in ads on your Kindle, make sure to check out www.AmazonLocal.com!